The thirteenth Docedge AFD commenced today withfilmmakers and tutors from different parts of the world coming together to makethis program a mutually enriching experience. This year there are severalparticipants from different Asian countries. The first day began with participantsqueuing up enthusiastically at the Registration Desk, with 13 international andover 11 Indian projects. With an air of excitement about them, everyone eagerlywaited to be briefed about the days to come. Moderated by BishnuDevHalder, the DocedgeKolkata team welcomed theparticipants, observers and tutors to DocedgeKolkata AFD 2016 and briefed themabout the itinerary of the next few days. SharmisthaSarker (Program Coordinator, Goethe InstitutKolkata) and her team addressed the extended Docedge family as well. This wasfollowed by everyone introducing themselves and briefly talking about theirproposed films and the tutors acquainting participants with their expectationsfor the sessions to come. SharmisthaSarker (Program Coordinator, Goethe Institut Kolkata)moderated the inaugural ceremony. Mr. FrisoMaecker (Director, Goethe InstitutKolkata) and NilotpalMajumder (Director, DocedgeKolkata AFD) formally welcomedthe guests and participants during this session. Next, eminent filmmaker and poet BuddhadebDasgupta,the Chief Guest, spoke at length about filmmaking and how DocedgeKolkatainspires both upcoming as well as experienced filmmakers to push themselves toachieve their best. He also stressed upon the need for a foundation to supportyoung Indian filmmakers locally. Synopsis: Young Chan has lost hisvision and hearing from a serious fever when he was very young. He often describeshimself as a ‘snail’ since he has to rely only on his tactile senses, just asslowly as a snail, to communicate with others. Being unable to speak other’slanguage, he once believed he had been singled out from the world. But an angelof a woman walks into his life. ?Soon Ho, as short as a little girl, who is alsodisabled, changes his life dramatically. Being married to her, he explores thethings he can neither see nor hear. The once lonely snail goes sleighing,swimming and writes essays, poems and even a script for a play, translatingevery experience into his unique words. The movie was followed by an interactive session withone of the producers of the film, Gary Byung-seokKam. Day 2 of DocedgeKolkata 2016 opened with the first round of pitch labs.As has been the trend over the years, the participants presented their pitchesbefore the tutors, fellow participants and observers. To take the floor in the presence of so manydistinguished tutors can prove to be a daunting task, but the participantsshowed a lot of grit. Talking out loud about their projects and receivingvaluable feedback left each presenter with a lot of fodder for reflection. Synopsis: Our curse is the personalstatement of the director, Tomasz Sliwinski, and his wife, who have just foundout that their newborn child Leo has been diagnosed with a very rare andincurable disease – Ondine’s Curse. The illness causes the complete cessationof breathing while a patient is asleep, meaning he must be attached to aventilator for the rest of his life. The film shows how these young parentscope with and work to tame their fears for their young family. Synopsis: “It’s amazing how adaptablewe are when we have to be. It’s what separates us and defines us as humanbeings.”?Within a year, Neil Platt goes from being a healthy 30-somethingBritish bloke with a great sense of humour to becoming completely paralysed fromthe neck down, thanks to the devastating illness he has inherited – known asALS, MND or Lou Gehrig’s disease. ?Knowing he only has a few months left tolive, and while he still has the ability to speak, Neil retains a lot of humourand puts together a letter and memory box for his baby son Oscar andcommunicates his experience and thoughts about life in a blog – and in thisfilm which he was determined to make. The movie was followed by an interactive session withone of the directors of the film, Emma Davie. The second day of Pitch Labs saw more confident pitching practicessupported by insightful inputs from the tutors to infuse the proposed ideas andvisual trailers with greater clarity. The previous day’s edginess now replacedby poise and composure among the participating filmmakers, the discussions weremarked by greater interactivity and evolution. The tutors were notably invested in the projectspitched and communed with the participants optimally, sharing their thoughtseven during lunch and tea breaks. The observers were seen taking a keeninterest in offering their two cents to the participants about their storiesand trailers. Filmmaker and independent producer Boris Mitic´, in a three-hourlecture, outlined the opportunity and hurdles of co-production with his uniquepersonal views. Humorous, insightfuland realistic, the session revealed somehard-hitting facts about the complex international co-pro landscape to thefilmmakers. Boris also elaborated and emphasized on the technique?of networkingas well as the assessment of buyers/commissioners through proper research. Synopsis: All around the world, at any given moment, randompeople post personal video clips online. They are their virtual messages in abottle, tossed into the boundless sea that is the Internet. Most of these postsflounder in a sad limbo of indifference and anonymity – unless your YouTubehandle happens to be Princess Shaw. Samantha Montgomery, 38, lives on her own in one ofNew Orleans’ toughest neighbourhoods. By day she works as a caregiver for theelderly; at night, she transforms into Princess Shaw, belting out soulfuloriginals at sparsely attended open mic nights and posting homemade a cappellaclips on YouTube to a handful of followers. One of them is Kutiman, a.k.a.OphirKutiel, an Israeli musician living on a kibbutz outside Tel Aviv, whomixes together one of Montgomery’s clips with instrumentals posted online byrandom musicians, resulting in a surprising reversal of fortune for theunforgettable Princess Shaw. The participants attempt to extract and absorb as much insight from thetutors as possible to get their final trailers and pitch styles ready. Today provedto be a rather hectic for the tutors as well as they wanted to make sure theydo everything to get flawless trailers and pitches from the participatingfilmmakers. Most participants forget lunch in a bid to perfectly edit theirtrailers and material! GaliaBador, the current Director of DocAviv—Tel Aviv’slargest and only festival in Israel solely dedicated to documentary filmmaking,spoke about her institute and its profile. DocAviv NPO – The Tel AvivDocumentary Film Festival was established in 1998 to promote documentaryfilmmaking in Israel and abroad. It is Israel’s largest film festival thatdraws a diverse audience from all over the country. DocAviv holds dozens of screeningsthroughout the year, along with workshops and master classes for buddingfilmmakers. The presentation was followed by thescreening of Twilight of a Life (70minutes, Belgium, Israel) directed by Sylvain Biegeleisen. Synopsis: When the doctor told methat my mother, aged 94, had just a few weeks to live, I left my home and cameback to Belgium to bid her farewell. But my mother decided that the time topass away has not yet arrived. We shared weeks and months of uncertainty andmystery together. I found myself filming hours of incredible conversations,humoristic situations and poetic moments. TWILIGHT OF A LIFE is a uniquedocument that proves that Old Age can be approached without fear, with humorand tenderness! "It is a great challenge for you," says my mother inthe film, "but you have to do it in a tough way. I build something for thefuture, not for the past!" she says. This film will touch a billion peoplefacing old age. It is a film that will give hope to everyone! The last day of the pitch lab sessions saw a lot of bustle as everyoneattempted to make the most of the limited time. Last minute exchange ofinformation and hurried changes made to trailers was the general sight allaround. Each project was given special attention during the one-on-one sessionsconducted by tutors. The participants wanted to make sure they had “pitchperfect” trailers to present the next day and the air was that of nervousexcitement. Paul Pauwels generously conducted a special session for the extendedDocedge family participants, where he counseled them on how to present theirstories on the big stage to make an impact. Though there are no hard-and-fastrules to follow while presenting one’s pitch, he spelt out the basic DOs andDON’Ts to have a successful pitching session. Emma Davie is a documentarymaker, currently teaching at the Edinburgh College of Art, where she is headsthe Film and TV Department and also works with the Scottish DocumentaryInstitute. Works of Davie include documentaries on art, such as What Age can YouStart Being an Artist? for Channel 4, which wasshortlisted for a Grierson Award, a more observational hour- long film for BBCcalled Gigha, Buying Our Island, Flight, which was aco-production with Canada and 71°N, a co-production withNorway. Her most recent work I am breathing has been screened inover 50 countries through an innovative method of distribution, which combinedfestival and cinema screenings with awareness raising events, including aglobal screening day on which it played in over 365 screens in over 30countries. She is currently working on a feature documentary film called Becoming Animal, which she is co-directing with Peter Mettler. In the session, Emma Davie discussedhow the “Thirty-six Views of Mount Fuji”, a series of landscape prints by the18th century Japanese ukiyo-e artist Hokusai, inspires documentary form. Byimposing structures, we can liberate ourselves as filmmakers, creating a framethrough which our observations of the world can emerge. When does structureappear? Before filming, during filming or on the editing table? How dodocumentary makers use apparent restrictions of filming “the real” creatively?Can limitations liberate a more precise creative response to actuality or forcea director to take more risks? Documentary structure is more thanscaffolding for scenes and character. It reflects how we see the world, what wethink filmmaking is about and what we are really exploring when we look at asubject. Drawing from the works of many international filmmakers and referringto her own experience while making I am breathing, this talk explored how narrative form emerges aided by use oflimitations, identification of motives and our own visceral responses to whatwe see. A panel discussion betweenAlly Derks from IDFA Netherlands, Claire Aguilar from Sheffield Doc/Fest UK,PrernaLanga from YES FOUNDATION India, Park Hye-Mi from DMZ Docs ProductionFund Korea and Nicole Tsien from POV USA took place, where the members analysedand presented how social causes can be portrayed and forwarded throughdocumentary films. 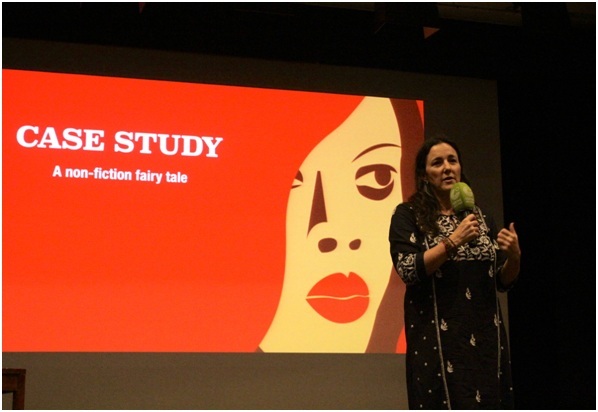 InternationalCo-Production: A Case study-Non-fiction Fairytale by Esther van Messel? Esther van Messel, CEO, First Hand Films Switzerland, discussed theunique journey of the film Thru You Princess, directed by IdoHaar and producedby First Hand Films as an international co-production case study from conceptto realization. For the first time in the history of DocedgeKolkata, arepresentative from an Indian motion picture studio—Drishyam Films—attended theprogram in order to select viable projects for production. Shiladitya Bora, theCEO of Drishyam Films, joined the Commissioning Panel. There were 12 pitches intotal, followed by a round of questions from the commissioning editors. The experiencedpanel members interacted with the participants, digging deep to understand theconcept of the pitched films. The filmmakers proceeded with individual meetings with the decisionmakers during the latter half of the day. These sessions aimed to help theparticipants present their projects better and get valuable feedback from themembers of the panel. Synopsis: In Pakistan, a rock starteaches a group of girls to express themselves through music in Karachi’s mostvolatile HamzaJafri travels in an armed vehicle. He is a musician famous forhis hard hitting political lyrics since the 1990s. Since then, religiousfundamentalism has been on the rise with shops selling music torched, concertsbombed and musicians threatened with death. Seeing the shrinking space formusic and artists, Hamza opens a music school. Shot over 3 years, Lyari Notesis the narrative of four young girls who attend Hamza’s music school and learnwhat it takes to express oneself, despite the cycles of violence. The final pitching session included eleven projects pitched in front ofthe commissioning panel. Paul Pauwels moderated the session again, making surethat the vibrancy and energy remained true to the Docedge spirit. Theparticipants skillfully presented their projects and got a lot ofpositivefeedback from the panel. After the pitching session, the participants met the panel members individually to answer questions regarding their projects. The participants were eager to explain and talk more about their projects and get the panel’ ssuggestions about how to better their films. An audience choice award, with theobservers and participants voting for the project of their liking, where thewinners are awarded a cash prize of INR 1850 each. The thirteenth DocedgeKolkata AFD ended with bouquets being presented to Mr. Atri Bhattacharya (Principal Secretary, Information & Culture,Government of West Bengal) and Ms. Prerna Langa (CEO, YES FOUNDATION). They acknowledge the success and contribution of DocedgeKolkata and express delight in being associated with it.